Glossy Box - This has to be my favourite this month, loved the hype and seeing all the beauty blogger's getting excited about it and the box lived up to expectations. It is amazing, I'm thinking the next box won't be as great due to the full sized Nars product but I'm excited none the less. 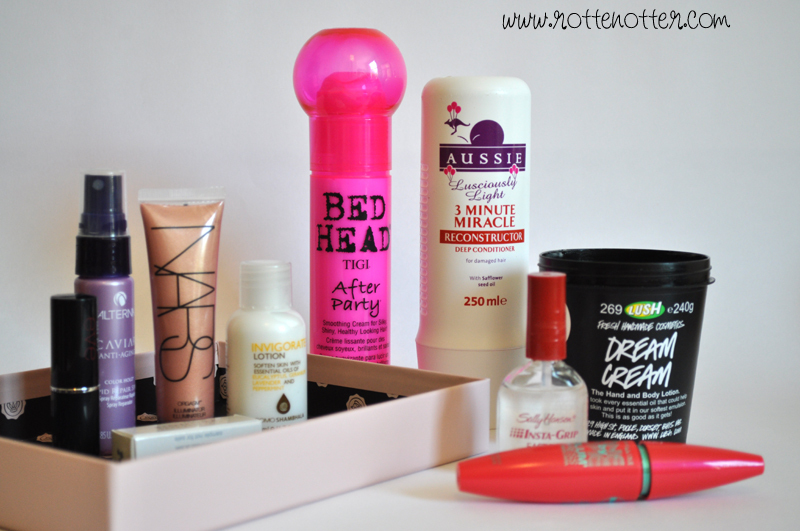 I'm not going to be writing a post each month about what is in each box, instead I'm going to include any products I like in my favourite posts. Bed Head After Party - This was one of my P20P half way purchases and I've been using it every day since. I comb it through my hair each morning and it just makes my hair look polished even though I haven't really done anything to it. It also controls any frizzy parts and I definitely noticed a different when I didn't use it the other morning, my hair was so fluffy!! Aussie 3MM - I've gone through so many bottles of this amazing conditioner! Instead of leaving it on for 3 minutes I've been applying it to dry hair, roots to ends, and leaving it on for 15 minutes them shampoo and conditioning like normally. This along with a little trim has worked wonders for my hair and it's made a huge difference. Sally Hansen Insta Grip Base Coat - I had this for probably about a year now and have hardly used it. Base and top coats just don't seem to work on my nails, they make the nail polish peel off straight away. For some reason though this has really been working lately and my nail polish has been lasting 5 days with no chips. Lush Dream Cream - I holy grail product for me and one I will buy for as long as they make it. It clears my eczema up really quickly without using any steroid creams and sorts my dry elbows out. You can read my full review here. Maybeline One By One Mascara - I've been really impressed with this mascara, I bought it without too much thinking, I needed a new one and this was on offer. Love the packaging and the mascara is great, defines my lashes as well as lengthening. What are your favourite products from May? I bought dream cream two days ago as I heard it was good for keratosis pilaris that I have on my arms...so far so good!